← Red Velvet Brownies (Gluten Free) with Cream Cheese Frosting… The 5th Day of Christmas Cookies!! 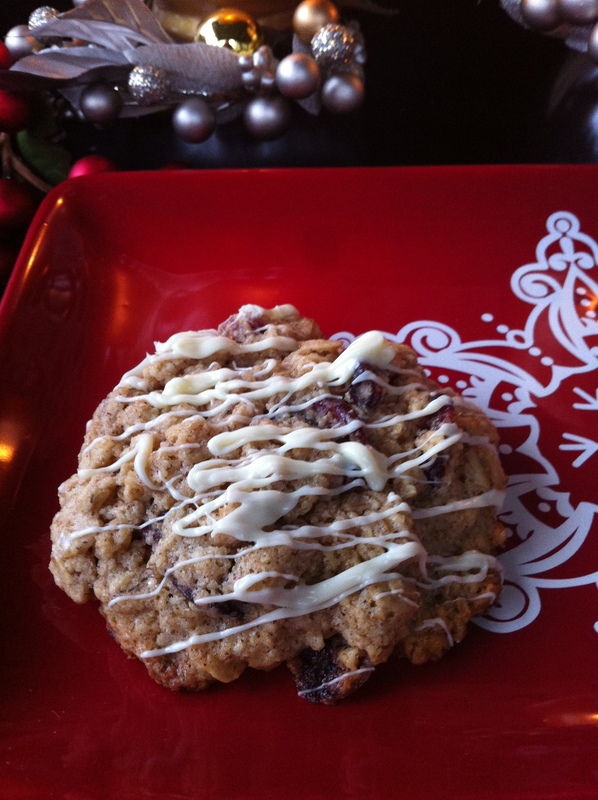 Oatmeal Cookies with Dried Cranberries and White Chocolate Drizzle… The 6th Day of Christmas Cookies!! 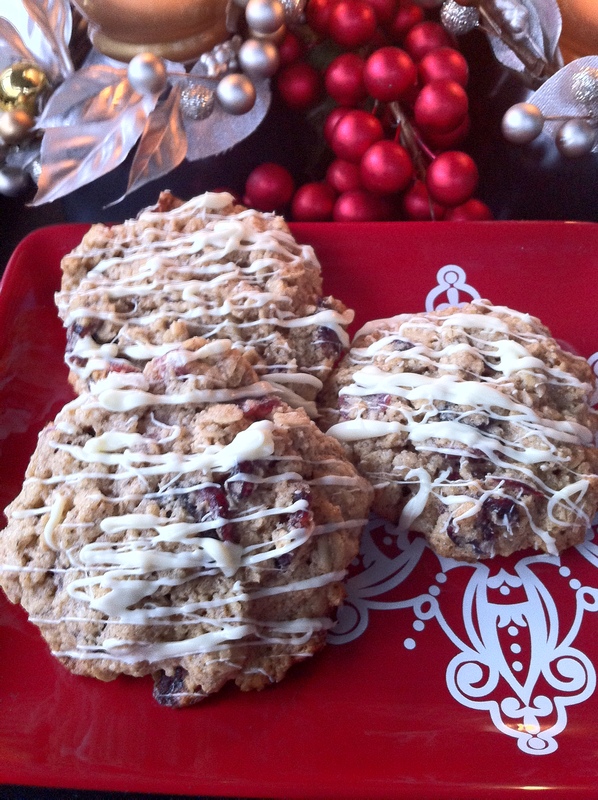 The 6th day of Christmas Cookies brings us an old favorite updated with dried cranberries and white chocolate. 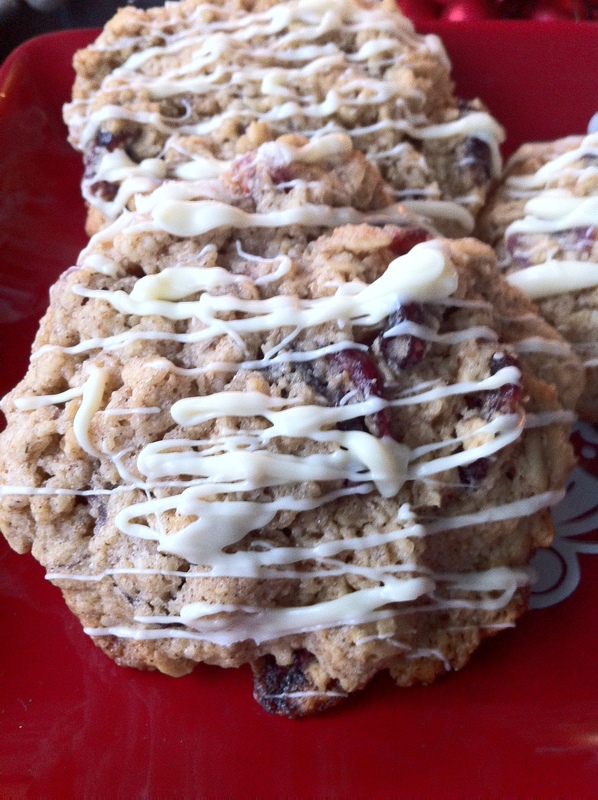 These are NOT your Granny’s Oatmeal cookies! 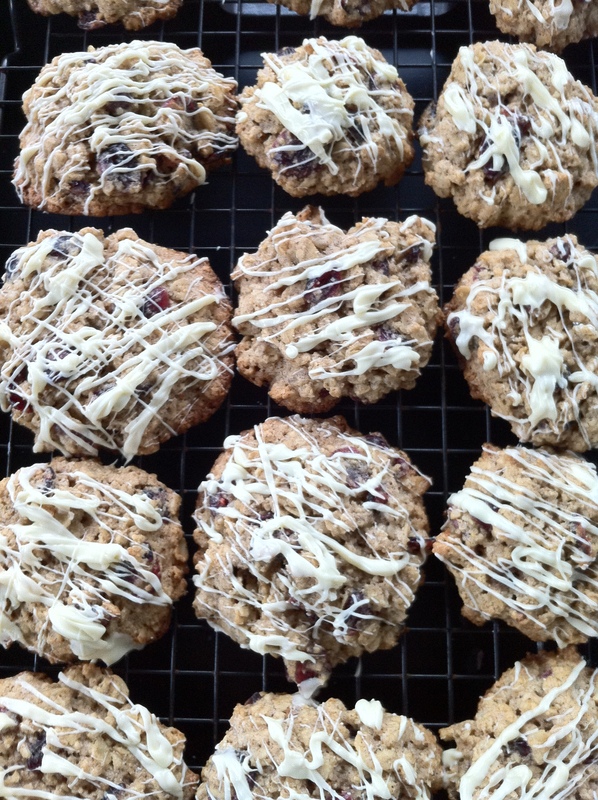 While Granny stuck with raisins, I have given these timeless cookies a facelift with tangy, chewy, cranberries and topped the cookie off with melted white chocolate. These changes turn the ordinary into the gourmet treat. My oatmeal cookies don’t require any obscure flours or flour mixes either, just gluten free oatmeal and plain old corn starch, making them economical as well as delicious! For a different treat, you can also substitute dried cherries for the cranberries, and the results are just as spectacular. Preheat oven to 350. 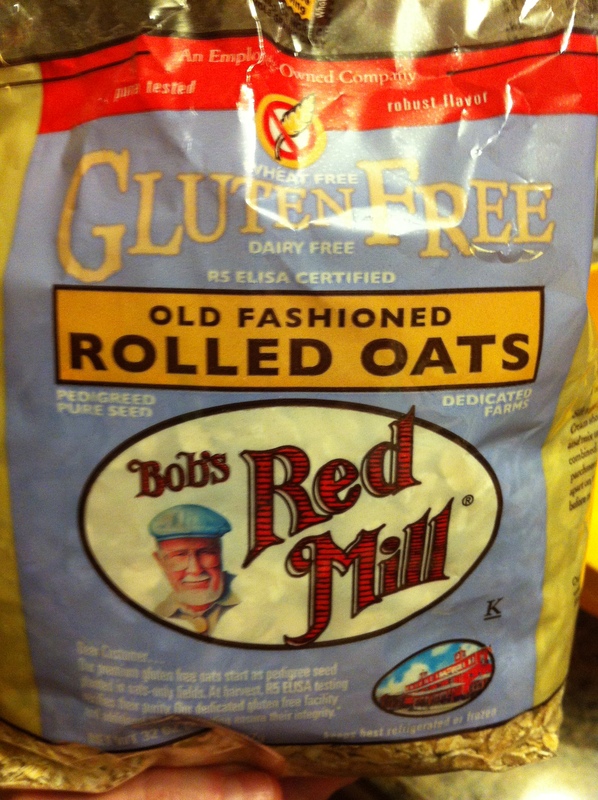 In a blender or food processor, place 1 1/2 Cups of the gluten free oatmeal, and grind to a fine meal. 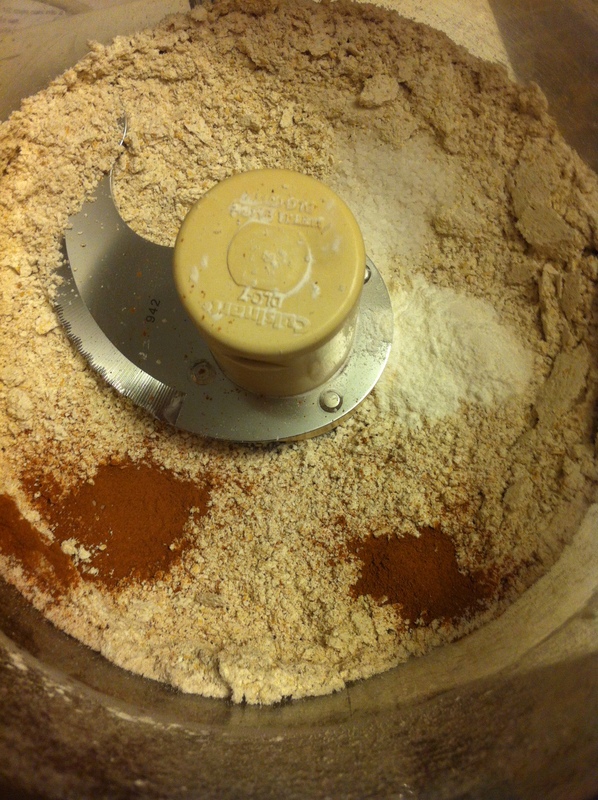 Add the cornstarch, cinnamon, baking powder, and salt, and process for a few seconds to mix ingredients. Set aside. In another bowl, mix the softened butter, the white granulated sugar, and the brown sugar thoroughly. Add the eggs and vanilla, and mix until batter is uniform (you can use a mixer for these steps if you would like). Stir in the oat flour mixture until well mixed, then fold in the remaining 3 cups of oats and the cranberries. Drop dough in heaping 1 to 2 Tablespoon mounds onto a parchment lined cookie sheet, flattening slightly with your hand, 2 inches apart. Bake 15 to 18 minutes or until edges of cookies are golden brown. Let the cookies cool on the cookie sheet for 5 minutes, then transfer them to a cooling rack to cool completely. When cookies have cooled, melt the white chocolate in the microwave, stirring at 30 second intervals until almost melted, then stirring remaining unmelted chocolate until no lumps remain (or over a double boiler stirring constantly). Stir in coconut oil or solid vegetable shortening until melted. Dip a fork into the melted chocolate and drizzle the chocolate over the cooled cookies. Let the white chocolate set a few minutes before serving. *It helps the clean up if the cookies are on a piece of parchment paper, a cookie sheet or a large plate. Enjoy this new twist on and old time favorite. I bet even Granny would approve!